In just over two months, the Disneyland Resort will open the gates to Star Wars: Galaxy's Edge, and welcome the first visitors to the fictional planet of Batuu. In January, we detailed some of the preparations Disney managers are making in advance of the grand opening, which Disney has code-named Project Stardust. Today we have an update both on the work already announced, as well as new projects planned for spring and summer 2019. Despite an unusually rainy California winter, the $300,000 makeover of Sleeping Beauty Castle is on schedule and expected to be completed by the time Star Wars: Galaxy's Edge opens in May. The park added ramps along Main Street U.S.A. to make it easier for people using wheelchairs to navigate the walkways, and just shared plans to completely eliminate the curb along the outside ring of the Central Plaza. Disney plans to eliminate the curb around Central Plaza to help ease traffic flow through the area. Photo by Todd Pickering. This work will happen in phases, with the west half of the plaza completed by summer 2019. Work will begin on the east half in winter 2020. Disney officials said they wanted to focus on the east side of the park now to help with traffic issues related to the opening of Star Wars: Galaxy's Edge, but also the bottleneck that occurs as thousands of people leave the Rivers of America area after each performance of Fantasmic. One project that may take longer than hoped is a planned widening of the bridge at the Adventureland entrance. Officials say it was more difficult than anticipated to remove the alcove on the bridge and replace the sign, but they are hoping to complete the project by June. One way park managers have succeeded in improving traffic flow on that bridge has been to close the standby line for the Tiki Juice Bar during the busiest days, and leave the stand open just for customers picking up orders placed through Disney's mobile ordering service. Customers craving a Dole Whip treat can step through to the adjacent Tropical Hideaway, the new quick-service restaurant in the former Aladdin's Oasis space. This venue offers an expanded Dole Whip menu with a minimal wait. Just as the Fastpass and MaxPass programs have changed the way in-the-know visitors wait for their favorite rides, they also change the way Disney responds to situations like a temporary ride closure. 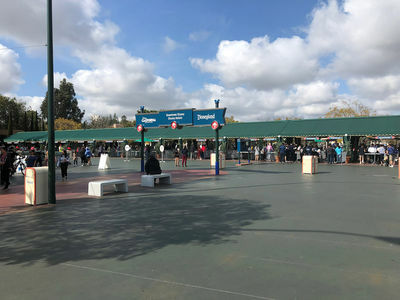 Disneyland will soon roll out a new recovery process for the MaxPass offering. Under the current system, Fastpass users who discover their ride is closed during their assigned return window are permitted to use their Fastpass ticket at the same attraction once it reopens that same day. While this may mean Fastpass users will have a longer-then-usual wait once the ride reopens, cast members can adjust the ratio of Fastpass versus standby riders to keep the line moving. For visitors using Disney's added-cost MaxPass program, if a ride for which they hold a digital Fastpass has downtime, the system automatically replaces that Fastpass with a digital "multiple experiences" pass. This pass is valid at any Fastpass attraction, which is great for users, but wreaks havoc with the standby and Fastpass lines at the most popular rides. The "multiple experiences" wording is also confusing for users, and the app interface does not explain why this was issued in place of the Fastpass they expected to use. With this change, Disney will now issue "replacement Fastpasses" to MaxPass users in the event of a ride downtime, and the Disneyland app will explain that the visitor's first-choice ride is unavailable. Disney will group Fastpass attractions into two tiers, and a replacement Fastpass is valid only for a ride in that same tier. For now, an example of the Tier 1 rides include Matterhorn Bobsleds, Indiana Jones Adventure and Space Mountain. Tier 2 includes rides like Buzz Lightyear, Big Thunder Mountain, and Splash Mountain. Disney will release a full list of Fastpass rides and groupings at a later date, and may change the list based on seasonal demand. Before visitors can even think about walking down Main Street U.S.A. getting a Fastpass or enjoying a Dole Whip, they have to get into the theme parks. For the majority of Disneyland Resort visitors, the arrivals process begins with driving to Anaheim and parking their car in a Disney lot. A new pedestrian bridge over Magic Way will take visitors from the two parking structures to Downtown Disney. Photo © Disney. 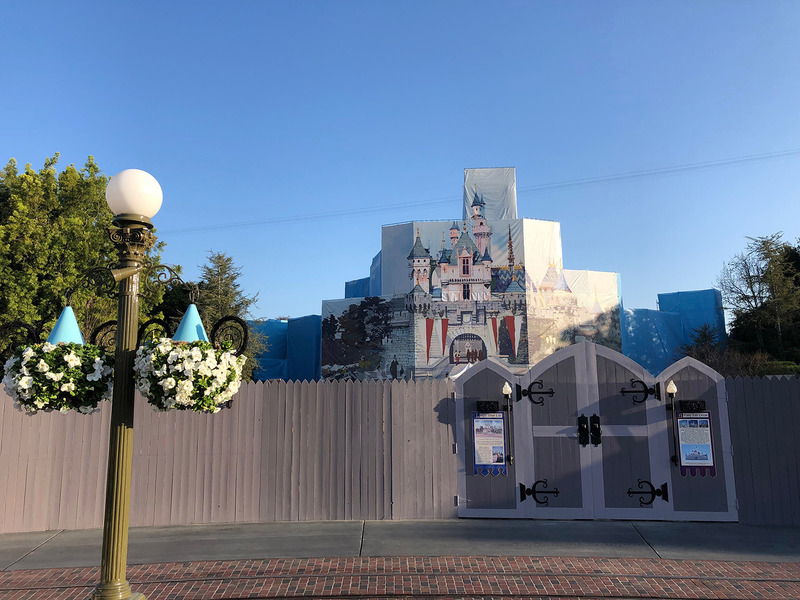 We've detailed Disneyland's traffic and parking challenges at length, along with the steps Disney has taken to ease some of the pressure points. The company last year broke ground on a new six-story parking structure adjacent to the existing Mickey and Friends structure. 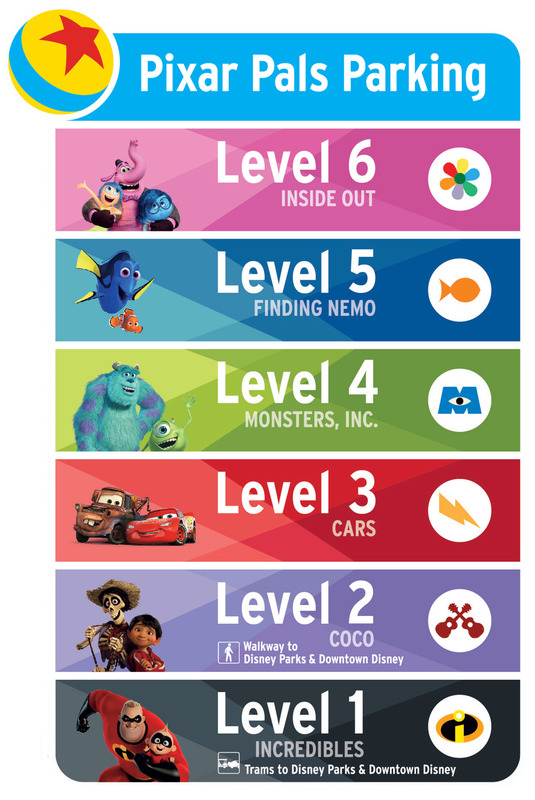 Though the garage was known as the Cleo structure during the planning phase, Disney has announced the new complex will be known as the Pixar Pals parking structure. Along with 5,300 new parking spaces, the Pixar Pals structure also has additional toll booth lanes, which Disney officials say will improve the throughput by 80 percent and help clear congestion on nearby city streets. The structure was originally slated to open in September 2019, but Disney now expects the parking garage to open by the end of July at the latest, and possibly as early as the end of June. 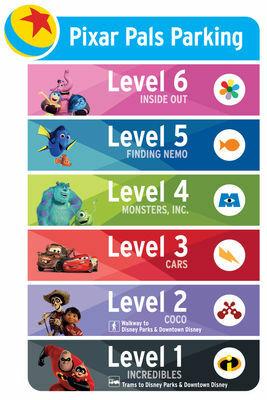 The new Pixar Pals parking structure may open as early as the end of June. Photo © Disney. On the east side of the resort, Disney is expanding the Toy Story parking lot by converting most of a lot currently used by resort employees into visitor parking, to be known as the Bullseye lot. Disney is also building a security checkpoint to screen visitors before they board the buses heading to the theme parks. Arriving guests will then be dropped off inside the security zone and can be on their way. Disney added security lanes at the Harbor entrance to help ease crowding. Photo by Todd Pickering. Disney officials say this new Toy Story lot checkpoint will help greatly reduce congestion at the Harbor Boulevard entrance, where the company recently added more checkpoints to screen visitors arriving by foot from Disneyland area hotels. Overall, Disney says a total of 33 additional security lanes have been added or are currently under construction. 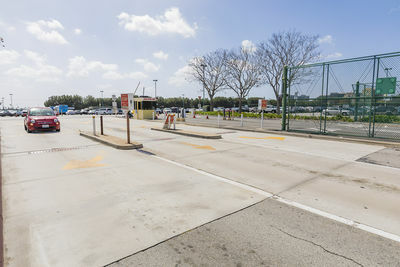 Disney will convert the Katella Cast Member Lot to visitor parking as part of the expansion of the Toy Story parking lot. Photo © Disney. Now if they would fix the drop off/pick up area. The uber/lyft people are taking it over and are getting beyond aggressive in trying to get in the area and never move from their places when they are parked waiting.